Little wonder, then, that the growing student movement in Pakistan held its biggest protest to date the day after Musharraf’s swearing-in ceremony. In cities around the world—from Oslo to London to New York to Lahore—students rallied at roughly 2 pm and called for all political parties to boycott the January elections in order to expose them for the sham they will likely be. In the weeks since Musharraf imposed a state of emergency, students in cities across the country have awakened from their political slumber. They have come a long way since 1999, when the general seized power in a bloodless coup. Then, the only people out on the streets were supporters of Nawaz Sharif, the ousted, democratically elected Prime Minister. This time, they are out in throngs—the lawyers, the journalists, the civil society activists and importantly, the students. The last time that students rose so powerfully in protest was in 1968, and they were instrumental in toppling General Ayub Khan (one of Musharraf’s dictatorial predecessors). But when Musharraf claimed power in 1999, many breathed a sigh of relief. From 1988-99, Benazir Bhutto and Nawaz Sharif both came to power twice. During this period—what Musharraf in his autobiography calls the “dreadful decade of democracy”—Pakistan became one of the most corrupt countries in the world. Unemployment soared and cynicism held sway in the minds of ordinary Pakistanis. Musharraf promised change. He promised to get rid of corruption, to tackle economic reforms, and he was a moderate. It seemed like a promising recipe at the time. But in the eight years that he has been in power, he has broken his word countless times. The elections he held were nowhere near free and fair, and according to Transparency International, Pakistan’s corruption rating has actually gotten worse by three percentage points since 1998, the year before Musharraf took power. LIVING under a state of emergency, it’s not surprising that many who once welcomed the general now agitate for his removal. 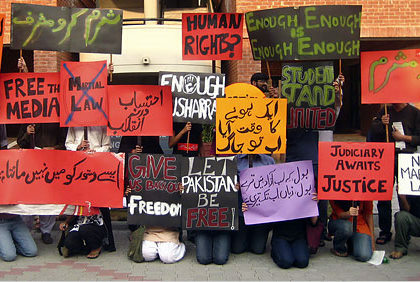 And standing in the frontlines—but not the spotlight—of those protests are the students of Pakistan. The movement has spread like an Internet virus. Although it began in campuses of elite institutions such as FAST-NU and LUMS, the baton has been passed to the lesser-known, public colleges with larger student bodies. 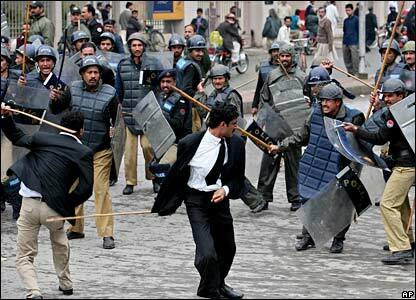 LUMS students, for instance, number only 2,500. Punjab University—which attained notoriety in the international press when opposition leader Imran Khan was apprehended there—is one of the new leaders of the movement, with roughly 25,000 students. In the history of student politics, Ammar explains, this is quite common. “The 1968 student movement began in Government College and Gordon College, which were then as prestigious as LUMS is now. That didn’t reflect class interests, but the quality of the education and the academic environment.” Now other universities—among them the Quaid-i-Azam University, Punjab University, Hamdard University and Government College, Lahore—are taking the lead. This article was published on The Nation‘s website on 30 November 2007.